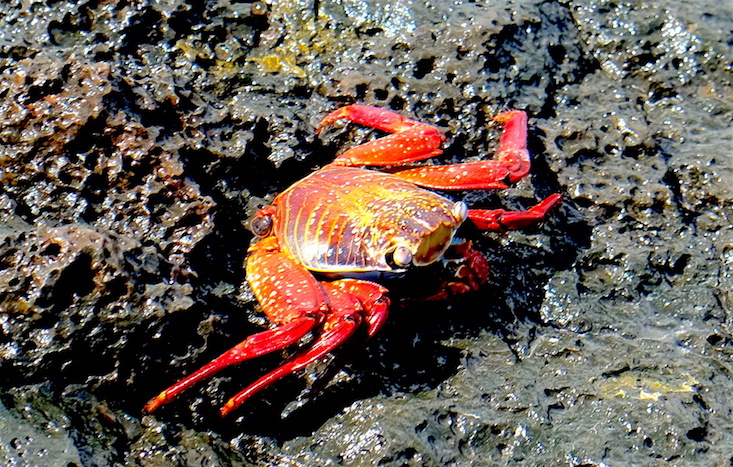 Lying 1,000 kilometres to the west of mainland Ecuador are the Galapagos Islands. These volcanic islands are famous for being home to some interesting and unique species of wildlife, for inspiring Charles Darwin to develop his theory of evolution, and for being one of the most expensive places to visit in South America. There was no getting around the cost of return flights from Quito (around $330 each), or the national park entry fees (another $120 each), but thanks to my friend Clare, who wrote a blog post about her travels to the Galapagos Islands as part of her trip to South America a few years ago, we knew that once we reached the islands there was no need to take an expensive cruise. Instead we could travel independently, organise our own “land-based” itinerary with day trips to other islands and diving spots, and stay within our budget. Or at least stay close-ish to our budget. 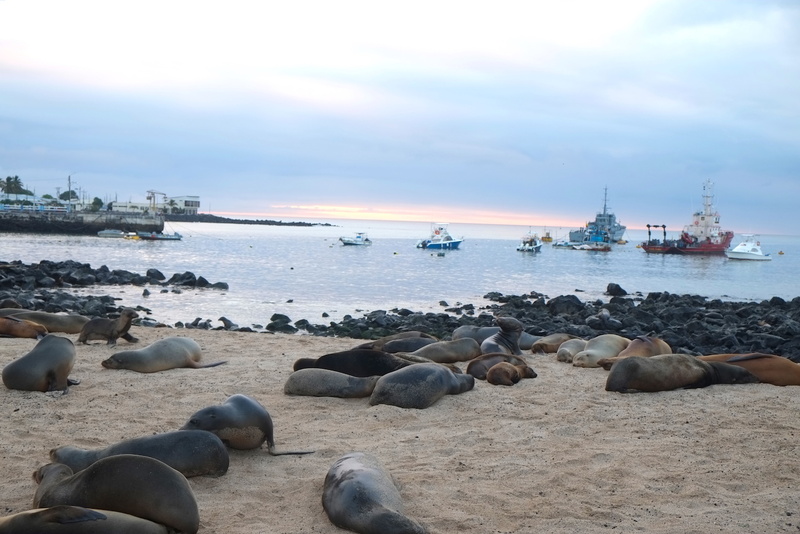 As well as being expensive, getting from Los Angeles to the Galapagos Islands turned out to be fairly time consuming. Our journey took a total of four days. First we flew from Los Angeles to Dallas, where we were greeted with much excitement about the upcoming royal wedding (“You guys must be SO EXCITED”, “this is going to be the best weekend OF MY LIFE”, “wait, why are you here? You should be at home! YOU MEAN… YOU’RE GOING TO MISS IT?? ?”), which we returned with some confusion and bewilderment. We spent 17 hours in Dallas, waiting for our next flight to Quito, Ecuador. This was partly because we wanted to save money and book flights using our air miles, which limited our options, and partly because I made a slight timing error – we landed in Dallas at midnight, and left again at 5.30pm the following day (not 5.30am, just a few hours later, as I had originally assumed). When we arrived in Quito, it was nearly midnight. I had arranged for us to be picked up at the airport (“I will be there with a sign for your name”, I was told via email), and to stay in a cheap hostel a few kilometers away. When we cleared immigration and collected our bags, we were greeted with several people brandishing signs with names on, but unfortunately no one for us. We waited patiently for half an hour, feeling tired and a little disorientated. Eventually, I phoned our hostel, only to realize that the Spanish I’d been trying to learn on duolingo was completely inadequate, and besides repeating my name and “aeropuerto”, there was nothing else I could think of to say in order to communicate the predicament. Shane took over the conversation, and despite knowing no Spanish at all, seemed to salvage the situation. “His brother is coming, and will be here in five minutes”, he said confidently. I had no idea how he had managed this, but was very grateful and relieved. That was until five minutes, ten minutes, 15 minutes went by, and still nothing. “Maybe he said 25 minutes, not five”, said Shane. I started to consider that perhaps Shane’s translation and communication skills were not as extraordinary as I had thought. As more and more time passed, we started to wonder what to do for the best. We took turns watching the bags and pacing around the airport; looking at the people waiting at arrivals and checking for signs with my name, the hostel’s name, or anyone who was also looking for someone. We wandered outside, inside, tried to get wifi to check or send an email… but nothing. Eventually, I decided to make another (probably pointless) phone call to the hostel, but realized my phone was now out of credit. I looked for a payphone, but couldn’t see one anywhere. Instead I found the information counter, and did my best to ask about a possible payphone location. Luckily, the woman working at the information desk spoke English and offered to make the phone call. As she watched me struggle (again) to communicate with the hostel, she took over and managed to translate. “Someone will be here in fifteen minutes”, she told me. I looked a little disappointed, and explained that we had already been told someone would be here in “five minutes” an hour ago. In response she got the number of the driver who was meant to be picking us up, and called him instead. It turned out he wasn’t far away, and Shane and I went outside and bundled into the car. While we were grateful to be finally leaving the airport and heading to somewhere we could rest for the night, I couldn’t help but feel disappointed in my woeful Spanish skills, and concerned that had it not been for the kind woman at the information desk, we might still be at Quito airport. We spent a full day in the small town of Guayllabamba, a few kilometers north of Quito airport, where we tried to rest and acclimatize before our flight to the Galapagos Islands the following day. We were both feeling a little worse for wear, so after a brief explore we had a long nap, which stretched into a long night’s sleep. The next day we were up bright and early for our flight to Santa Cruz, the most populous island in the Galapagos. Thankfully our transport back to the airport went without a hitch, and we arrived with ample time to check in for our flight, complete some Galapagos-Island related paperwork, pay an extra $20 tax, have our bags checked for anything that might endanger the eco-system of the islands, pass through security and have something to eat. The flight took two hours, and before we knew it we touched down at Baltra airport, located on a tiny island a short distance from Santa Cruz. 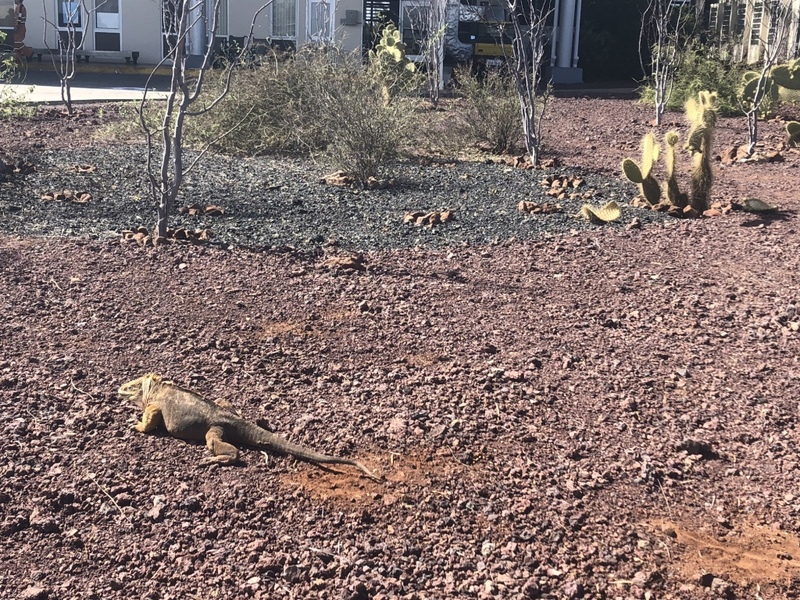 It didn’t take long to realize that we really were in a wildlife paradise; a large iguana greeted us as we stepped off the plane. We then had a long wait to pass through a special Galapagos Island immigration system. Once it was our turn, we were processed very quickly; our passport was stamped, we handed over our $100 entrance fee, our bags were checked once again, and then we were in. Despite our long wait at mini-immigration, the journey to Puerto Ayora did start like clockwork. A bus was waiting for us outside the main airport building. We got on, and once it was full, the bus drove us to the ferry. We all boarded the ferry, and for the price of $1 each we were taken to Santa Cruz. Then we got off the ferry and looked around for the bus to take us to the bus terminal outside the main town of Puerto Ayora. I saw a bus, and begaun to walk to it when a man stopped me. “Isn’t there a bus?” I asked. “But that looks like a bus”, I said, pointing at the bus. He shrugged his shoulders and moved on to someone who did want a taxi, and I carried on walking towards the bus. As we tried to get on, we were met by the bus driver, who shouted “no, no, no, no”. This was some kind of private bus, and was not for us. As we waited around for the elusive bus, the remaining taxis disappeared, leaving us and half a dozen other passengers with no transport options at all. A young Ecuadorean couple (also stranded), approached us and asked if we wanted to share a taxi, if or when such a thing re-materialised. We explained that we had been hoping to get the bus, and they explained that the last bus had gone. Shane didn’t want to be defeated and continued to hope for the bus, while I didn’t want to be stuck in the middle of nowhere at the edge of the island all night, so accepted their offer on our behalf. The only problem was that the offer was hypothetical, since there were no more taxis, and so we waited with the other passengers for some time. Eventually a taxi turned up. We tried to ignore the fact that the driver was drinking a beer as he pulled up and let us in, and instead focused on looking out at the island that it had taken us four days to reach. 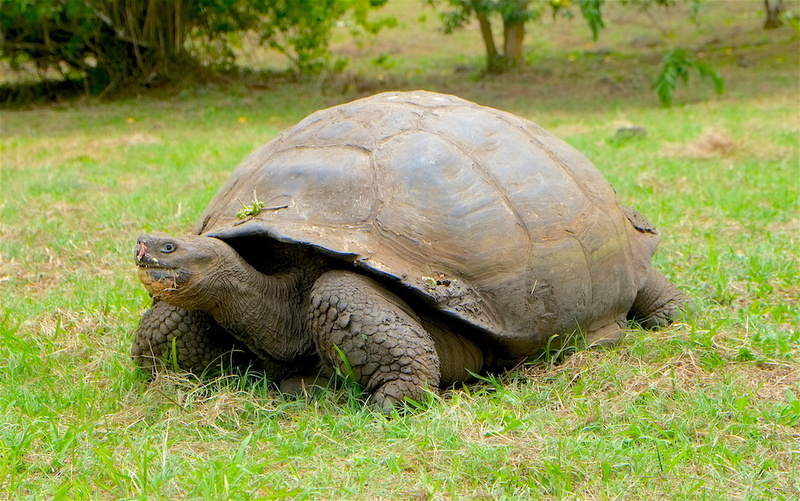 It wasn’t long before Shane spotted a giant Galapagos tortoise walking up the road, and I felt pleased with myself for remembering that the Spanish for tortoise is “Tortuga”. 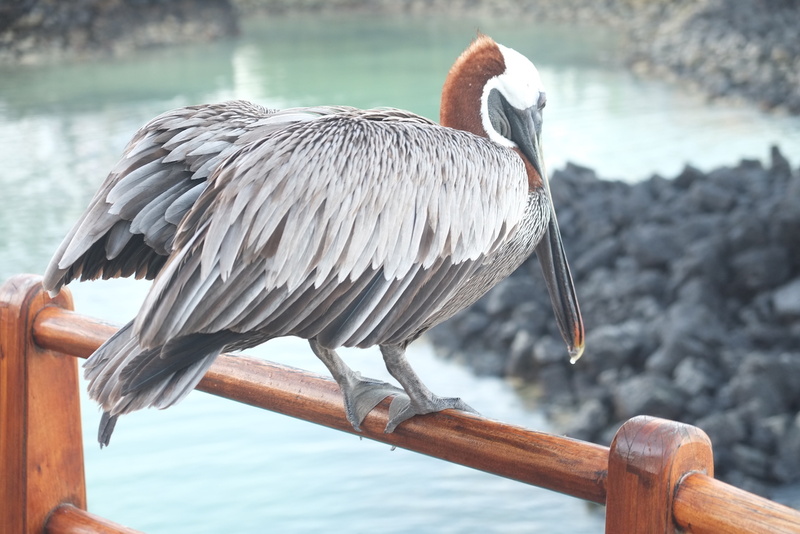 We spent eight days on the Galapagos Islands, and most days were dedicated to wildlife watching. We stayed on Santa Cruz for our first four days, and made the most of the free opportunities to see some animals. We didn’t have to go very far. 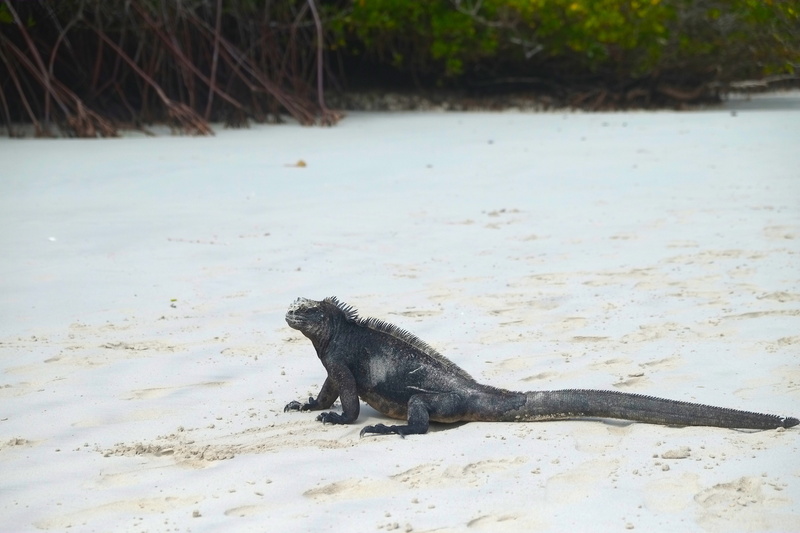 The Galapagos Islands live up to their reputation: they are bursting with wildlife. From the pier in Puerto Ayora we watched sea lions, sharks, sea turtles and rays darting through the water. We walked to the beach and saw brightly coloured crabs scuttling along the rocks, and dozens of marine iguanas lazing in the sun. 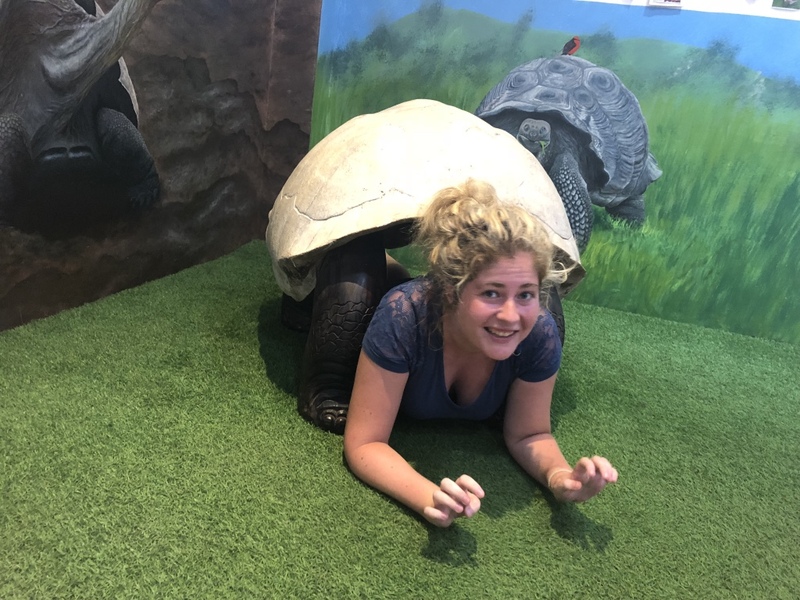 We walked to the Charles Darwin centre and saw giant Galapagos tortoises, as well as some little baby ones. Lizards of various shapes and sizes followed us everywhere we went, and pelicans flapped around near the sea front. 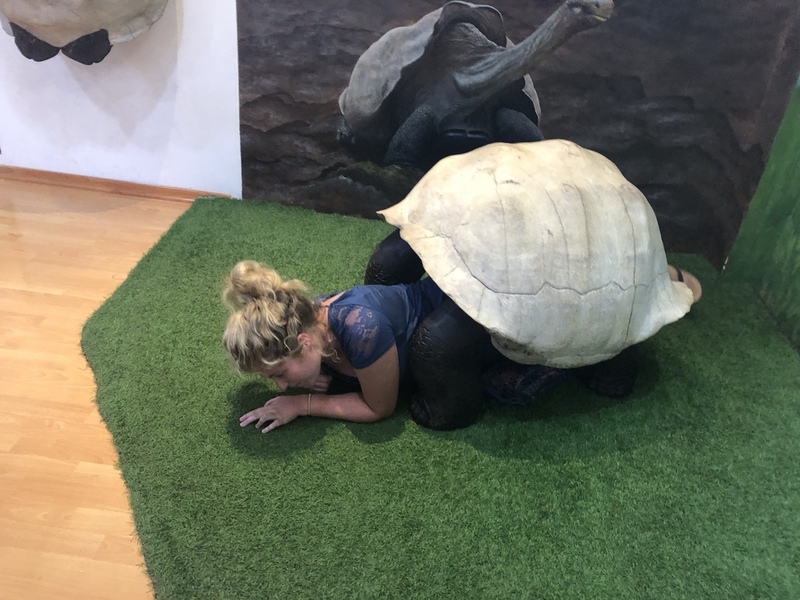 As well as watching the wildlife on our doorstep, we also took a taxi into the highlands to visit some big sink holes, lava tunnels and a ranch area where giant Galapagos tortoises raom freely. The lava tunnel experience turned out to be less about enjoying the lava formations, and more about getting from one end of the tunnel to the other in one piece, as we had to crawl through small gaps in the lava on our hands and knees and at some points even wriggle like a worm to make it though. 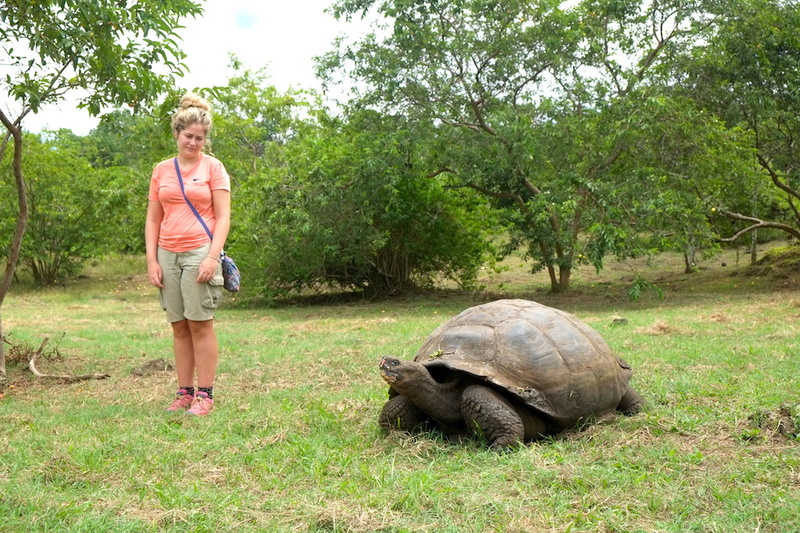 On the plus side, wandering around the ranch and watching the giant tortoises was a joy. The more we watched them, the more they looked like a biological anomaly – more like dinosaurs than tortoises – and every movement seemed to involve a struggle. 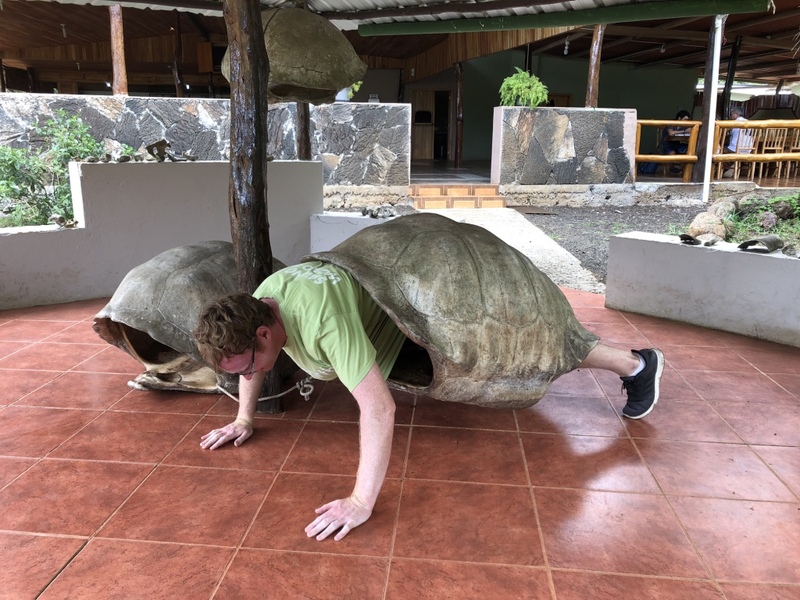 We were also delighted to try climbing inside the old tortoise shells lying around the ranch, and to realize that Shane is about the right size to be a giant tortoise! 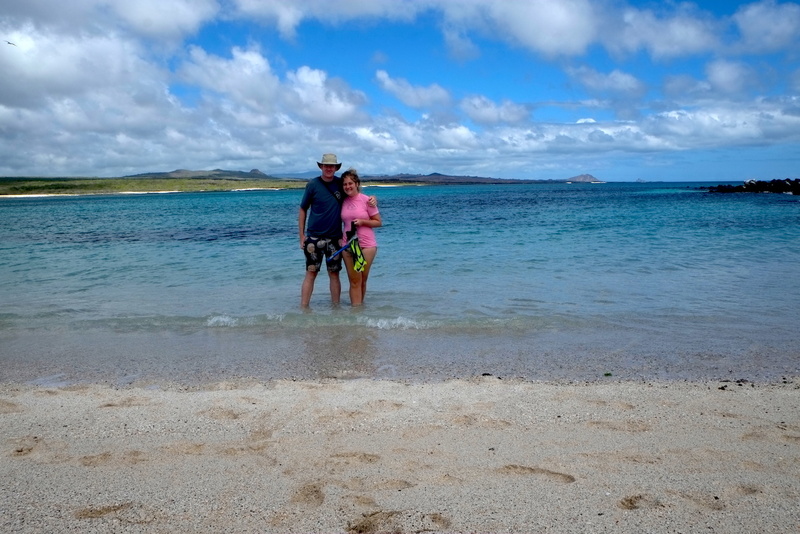 From Santa Cruz we also took a snorkeling trip out to nearby Pinzon Island and a diving trip out to Bartolome Island. 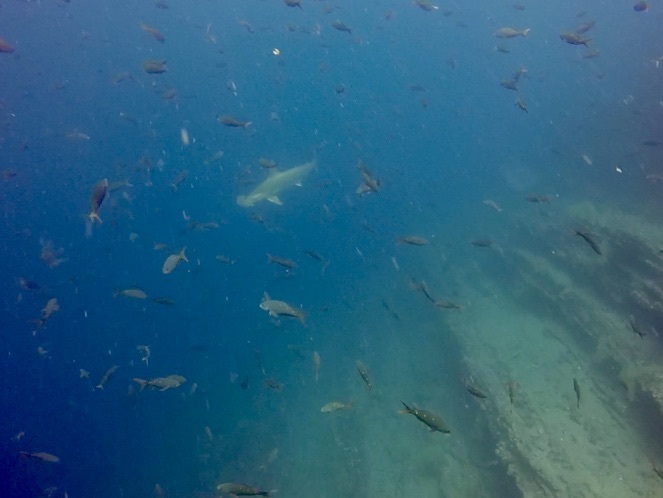 The snorkeling was expensive (welcome to the Galapagos Islands), but definitely worth it. 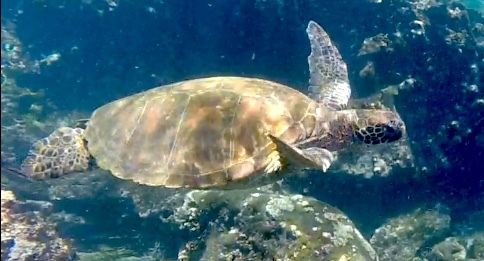 We snorkeled with sea lions, turtles, sharks and I even saw an octopus slithering along the rocks! The diving wasn’t quite as remarkable, but that was in part because our diving options were limited due to our lack of experience. 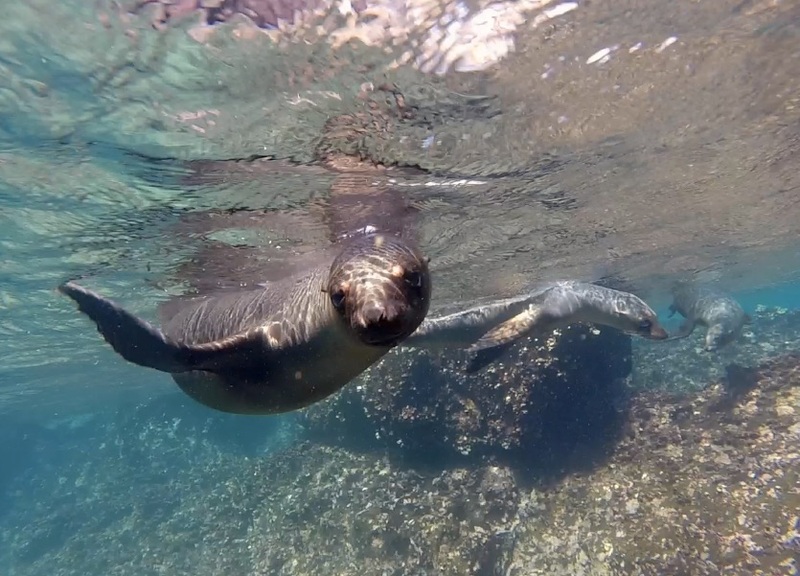 To visit most sites in the Galapagos, you need to have at least 25 dives, and / or to be an advanced diver. To visit some of the best sites, or to take a ‘liveaboard’ multi-day diving trip, you need 100 dives. As open water divers with only ten dives (never mind the fact that I would not describe myself as confident), this was never going to apply to us, so we could only visit certain ‘easier’ sites. 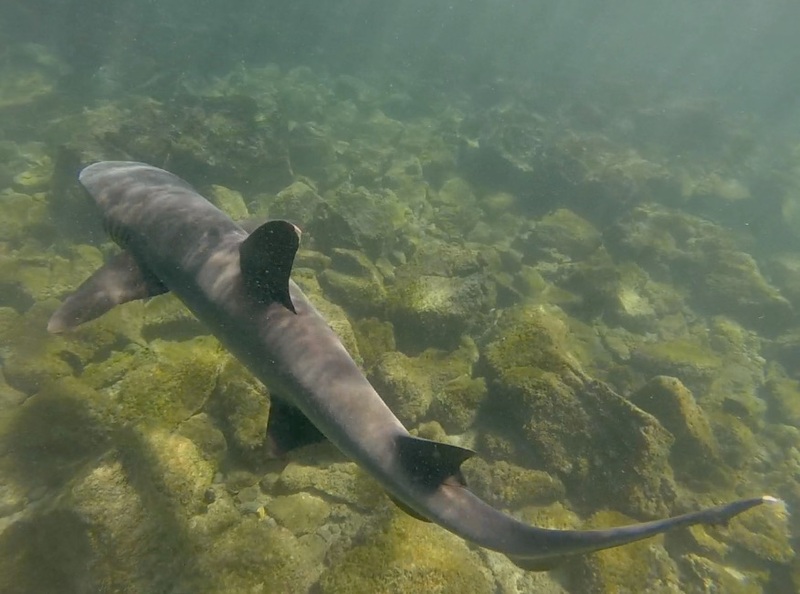 Nevertheless, we had a good day in Bartolome, and spotted rays, turtles and even a hammerhead shark under the water, as well as some Galapagos penguins swimming in the shallows. After some busy days on Santa Cruz we took a ferry to the island of San Cristobal, where we spent the rest of our time. 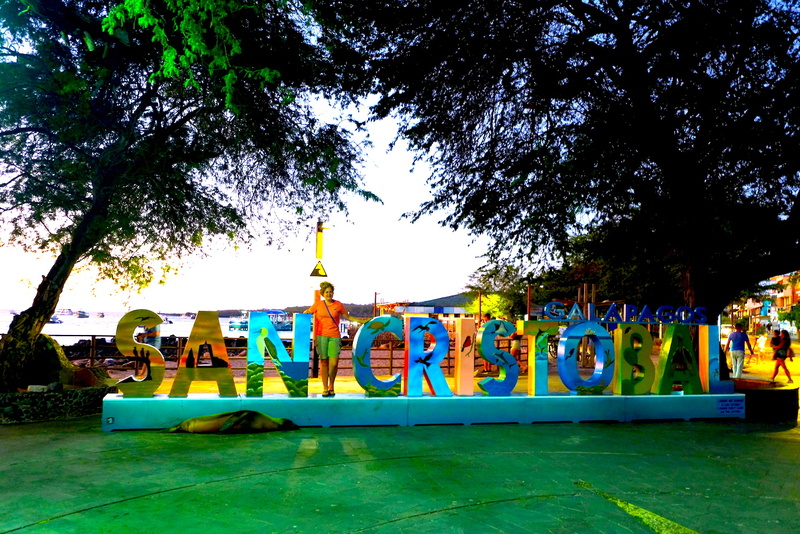 San Cristobal was smaller and less populated than Santa Cruz, a fact the sea lions seemed to make the most of by colonizing the entire sea front. Again, we made the most of the free activities on offer, visiting the island’s Interpretation Centre which gave us a detailed overview of the history of the islands and the impact of colonization (not good) and tourism (better, but still not great) on the delicate ecosystem of the islands. 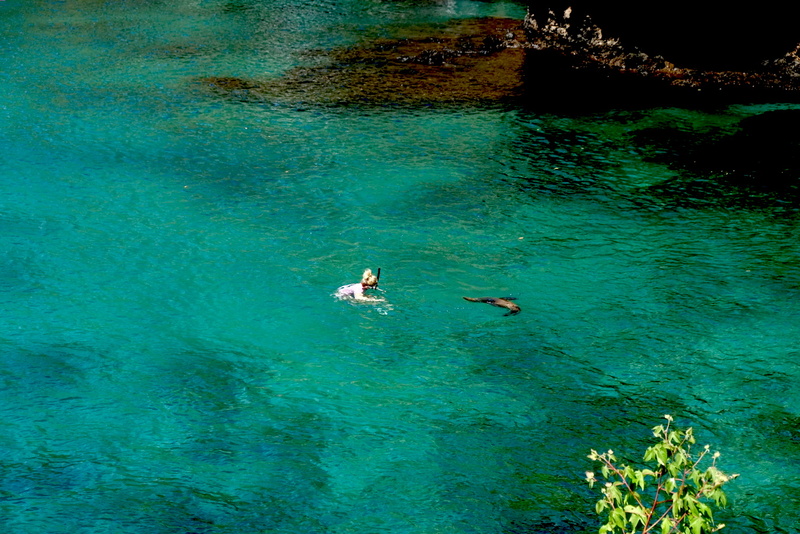 On another day we rented snorkel gear and wandered down to a secluded bay, where we could snorkel and play with the sea lions. Galapagos rules mean that you can’t touch the sea lions (and I would not want to), but that didn’t stop them touching me. Or splashing me. Or forming and circle around me and clapping. I don’t know why. Our final activity in San Cristobal was a 360 degree tour of the island. 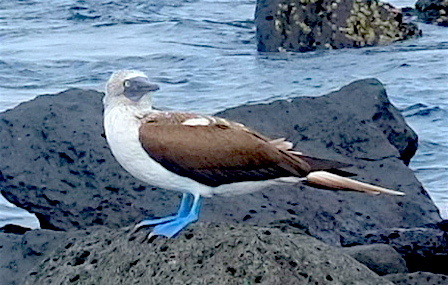 We visited various snorkeling spots including kicker rock (a rock shaped like a shoe), a beach nearby where we spotted the endemic and so-far elusive blue footed booby (a bird). We also saw a red footed booby, some puffer fish and the biggest sea turtle I have ever seen. It was bigger than Shane! 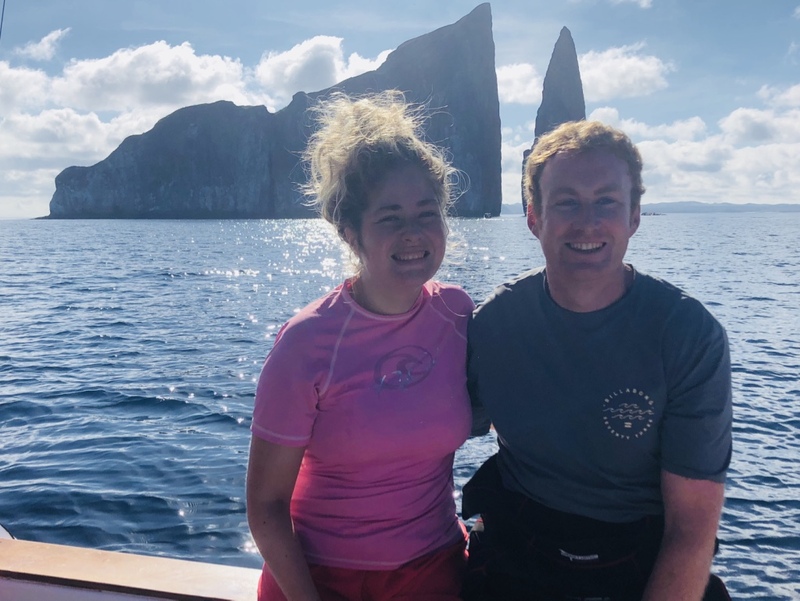 On our eight day self-guided, land-based tour, we managed to see numerous sea lions, turtles and sharks, several rays, dozens of iguanas, giant tortoises, beautiful crabs, pelicans, boobies (red and blue footed), a hammerhead shark and even an octopus or two. 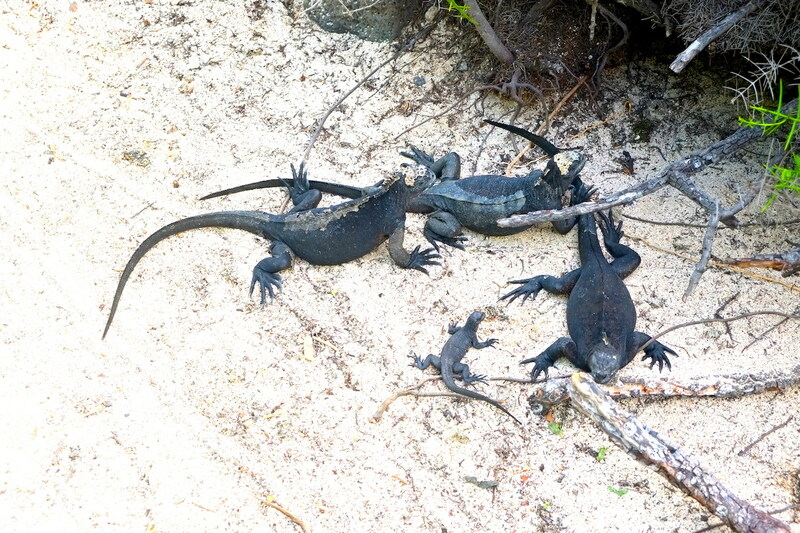 The rumour that the Galapagos Islands are some kind of wildlife paradise is absolutely true. 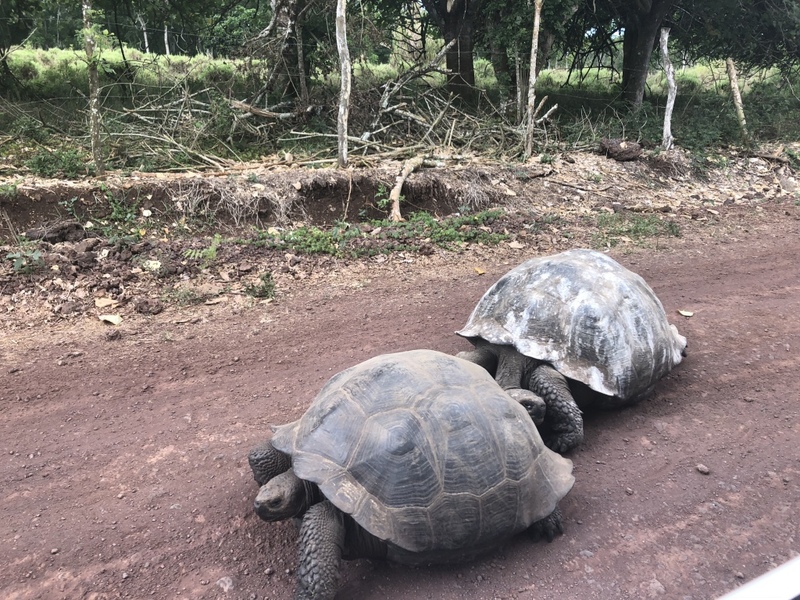 The rumour that they are time consuming to get to and expensive (by South American standards) is also true, but it is possible to travel independently, save a small fortune, and still see the animals the Galapagos is famous for. I remember reading ages ago that the hammerhead was the most dangerous of all and I believed it til Spielberg came along.